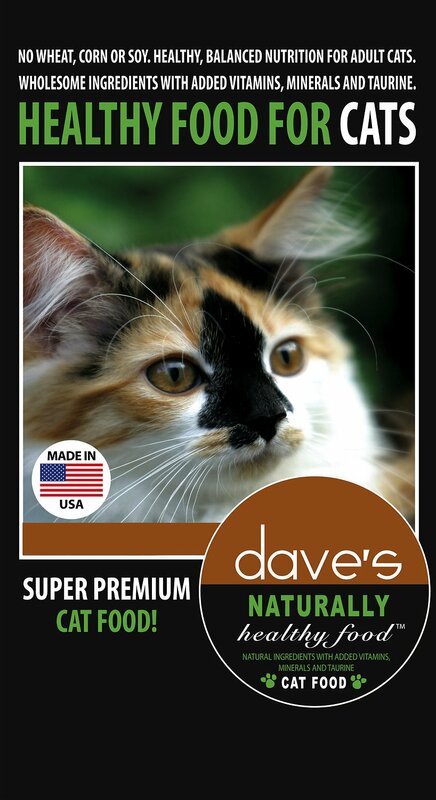 Give your kitty the nutrition he needs to thrive with Dave's Pet Food Naturally Healthy Adult Dry Cat Food. The formula provides plenty of protein to fuel all those adventures, with protein-rich chicken as the first ingredient plus wholesome brown rice. Every crunchy bite is loaded with wholesome omegas for a lustrous coat, cranberries for urinary health, along with vitamins, minerals and essential taurine to help your pal look and feel his best. With no wheat, corn, soy or anything artificial, even kitties with sensitivities can dive into their bowl. Wheat-free premium dry food is made with chicken as the first ingredient for animal sourced protein to support healthy muscles. 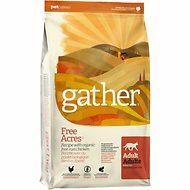 Provides a complete and balanced diet for adults cats of all breeds, with high protein and complex carbs from brown rice. Contains omega-3 and 6 fatty acids to nourish skin and fur, with zero wheat so it’s great for kitties with sensitivities or food allergies. Made in the USA with no wheat, corn, or soy and only premium, wholesome ingredients you can trust. 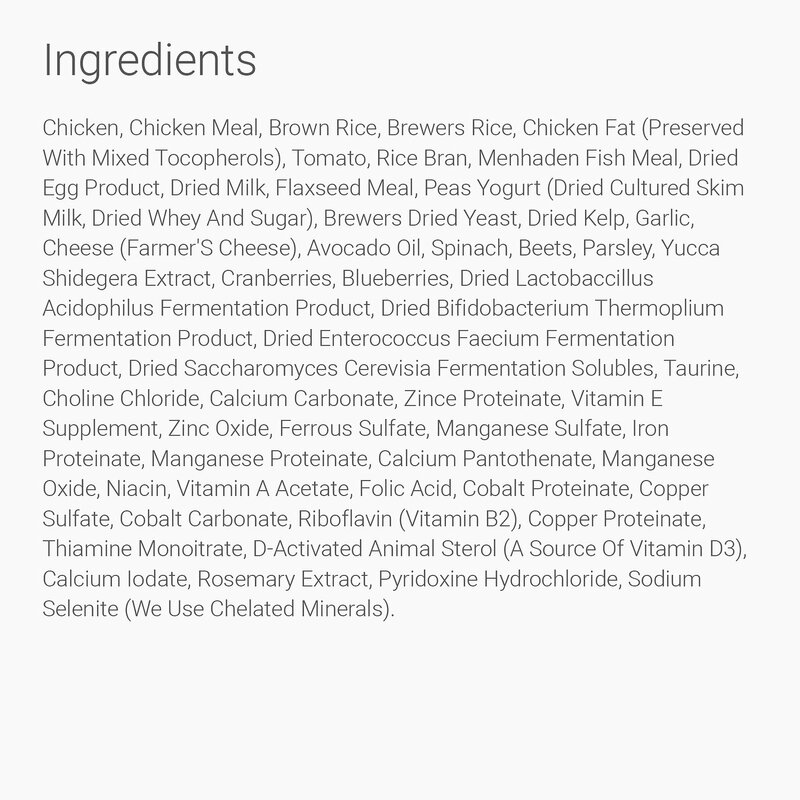 Chicken, Chicken Meal, Brown Rice, Brewers Rice, Chicken Fat (Preserved with Mixed Tocopherols), Tomato, Rice Bran, Menhaden Fish Meal, Dried Egg Product, Dried Milk, Flaxseed Meal, Peas Yogurt (Dried Cultured Skim Milk, Dried Whey and Sugar), Brewers Dried Yeast, Dried Kelp, Garlic, Cheese (Farmer'S Cheese), Avocado Oil, Spinach, Beets, Parsley, Yucca Shidegera Extract, Cranberries, Blueberries, Dried Lactobaccillus Acidophilus Fermentation Product, Dried Bifidobacterium Thermoplium Fermentation Product, Dried Enterococcus Faecium Fermentation Product, Dried Saccharomyces Cerevisia Fermentation Solubles, Taurine, Choline Chloride, Calcium Carbonate, Zince Proteinate, Vitamin E Supplement, Zinc Oxide, Ferrous Sulfate, Manganese Sulfate, Iron Proteinate, Manganese Proteinate, Calcium Pantothenate, Manganese Oxide, Niacin, Vitamin A Acetate, Folic Acid, Cobalt Proteinate, Copper Sulfate, Cobalt Carbonate, Riboflavin (Vitamin B2), Copper Proteinate, Thiamine Monoitrate, D-Activated Animal Sterol (a Source of Vitamin D3), Calcium Iodate, Rosemary Extract, Pyridoxine Hydrochloride, Sodium Selenite ** We Use Chelated Minerals **. Keep fresh water available for you pet at all times. For your cat's health see you veterinarian regularly. Dave's Naturally Healthy Cat Food is formulated to meet the nutritional levels established by the AAFCO Cat Food Nutrient Profiles for maintenance of Adult cats. 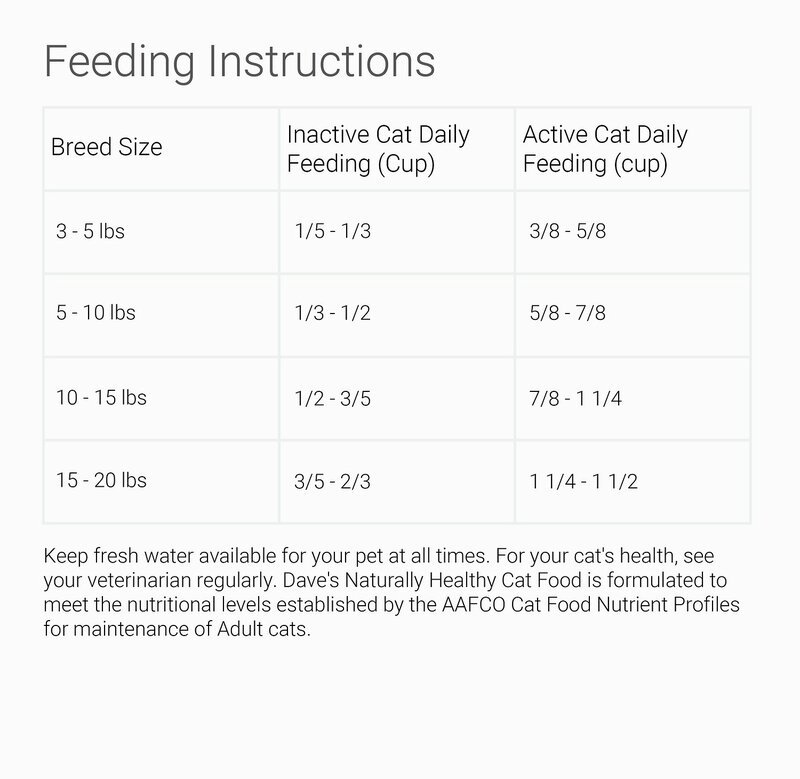 My cats like this food, but not to the point of overeating, I have several picky eaters, a couple old guys and a new kitten who all like this dry food. I buy the 8# bag because the larger bag seemed to get stale about halfway through, the best thing though is the way it settles in their stomachs, I had problems with cats throwing up and since I switched to a grain free plus no added colorants, my cats are doing so much better, even my 2 longhairs, don't yak like they used to, such a blessing! All my kids like it, it needs to be cut up some, but, good gravy content! My kitties didn’t go for it! My cats are moderately picky. They ate it the first day but after that, did not want it. It seems odd that they put these tiny little pieces in there that my guys didn’t bother with when they did eat it....seems wasteful...but maybe other cats would eat the little pieces. I used HiTor for many years until I got 2 consecutive shipments of rancid bags. Decided to try Daves. 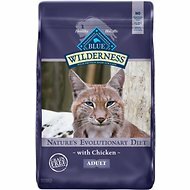 Cats like it, and I have 9 indoor and one outdoor cats, so I go through a lot of food and need something with decent quality that won't make us broke. My kitty is very picky but he loves this dry food. His coat is shiny and he's shedding less so we're both happy. The first bag I ordered was a big hit with my 3 cats. I then reordered and the bag was totally rancid. Date was exp 10-18. Chewy replaced it with a bag dated 6-18 which was even more rancid. Even the ferals won't touch it. Sad to say I will have to find a different healthy dry food for my cats as this one seems to have no shelf life. We fed Dave's canned and dry food for a few years. Over a year ago the cats stopped eating the canned so we switched to another brand. And this past year they only very reluctantly eat SOME of their food. Even the five ferals we feed will NOT touch it. So we gave up and donated about 1/2 of the last large bag we purchased. Our cats started on a new food yesterday and are gobbling it up. My cats will not eat this dry cat food at all. They like Dave's canned food, but won't touch the dry. Total waste of money this purchase was for me. Love Dave's Food so far, 5 cat household with special diets. We have had this food almost a month and so far all five of our cats are eating it. Additionally, we have one that has a tendency towards urinary crystals and he has shown no sign of any problems so far. We feed wet food twice daily with some dry left out overnight. All are thriving, energetic and happy. Will update this review if anything changes.